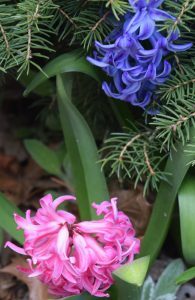 Evergreen needles (top) greet spring-only Hyacinth flowers. “A gardener’s never done,” a seasoned gardener said to me. I was just starting out as a gardener designing one space in my yard. I studied the plants that would fit best in that spot. My plants were going to have the right light and right amount of water as well as look wonderful in that spot. My imagination was running wild with the vision of what the space would look like finished. Then I asked for advice from the veteran gardener. Never done? Huh? The list of negatives was not very encouraging. Uncomfortable thoughts were going through my mind. Even the idea of giving up – maybe. Later that day a nearby neighbor saw me standing in the yard eyeing the space. My beautiful vision – well, I almost felt defeated before I started. And I had to start somewhere. Huh! Several garden projects later I have to admit the seasoned gardener knew some things. I have moved many bushes and perennials to other locations for most of the reasons given by my gardening friend. Some plants didn’t do well in a spot despite my best efforts to put a plant in the right place for its light and watering needs. A plant either barely survived until I could relocate it or it died rather quickly. In a few cases, a plant was dug up because its service was needed in another area. But the neighbor’s thought about using a space for something else besides a garden bed after I planted? Not interested in starting over! I made sure the area I chose to plant would be only for plants. My neighbor’s observation helped me think hard about how I was going to use my garden. Now my yard is at a reasonable capacity, but I can still find a new place to tuck in another plant. Today I went to the garden store for a replacement annual. In addition, I bought six perennials and a fairy garden planter. All on sale. Couldn’t resist. Yet another reason this gardener’s never done: falling in love with new plants! Tiny knots of flowers appear in late summer to early fall. What’s so appealing about this Knotweed? Is it the green and cream or white leaves with pale peach to dark red splotches on top? Is it the flowers – many tiny red or dark pink orbs on a long stem that appear above the leaves? Knotweed means tall, friendly color growing throughout the bed. Easy care makes it a keeper. Persicaria virginiana commonly called knotweed is a herbaceous perennial found in the U.S., Japan and Korea. It thrives in Zones 4-8. The leaf is oval. Green is the main color. Then it’s color on color: cream or white splotches topped by pale peach to dark red splotches. No two leaves look alike. Knotweed grows to about 24 inches tall. Its spread is one and a half to two feet wide. Bloom time is late summer, early fall. 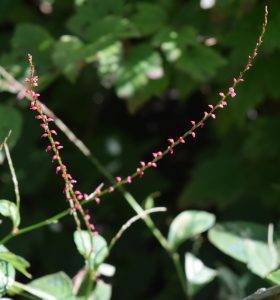 Tiny flower “knots” in red or dark pink bloom on a tall stem giving it the name knotweed. The second part of the name “weed” doesn’t apply to the variety Persicaria virginiana as it is not invasive. It spreads by rhizomes – thick looking roots that grow horizontally underground. It is also self seeding as the “knots” or flowers when dry, fall off and germinate. Pets sometimes sport little pink knots in their coats after brushing up against the stems. Where will the knots land? Full sun to part shade is required for good growth. Soil is average, well drained. Water needs are medium which is to say they tolerate some dry weather, but biweekly watering keeps them looking their best. Maintenance is low. No cutting back. No dead heading the flowers. No significant pests or diseases. After winter the stems look like dry sticks coming out of the ground. These can be removed or crushed in place. New growth covers them up as they decompose. Sometimes knotweed winds up in places where it’s not wanted. Pulling it out is easy. As a group they’re not dense enough to keep weeds from growing in between. If the weeds are below the height of the knotweed, they can’t be seen until closer inspection. Another type of knotweed called Fallopia japonica is invasive in the U.S. It chokes out native plants and should not be grown. 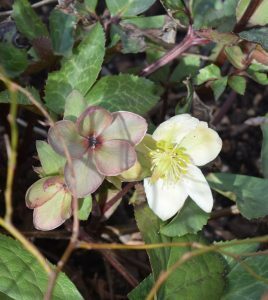 Naturalizing is the easiest way to enjoy them in the garden. Variegated leaves and an easy growing habit fill in a space with good color. Knotweed contrasts well with the green of nearby bushes. They can also be used in container plantings if kept well watered. Cut stems of leaves and flowers to add an unusual twist to a bouquet. Hosta leaves catch sunlight in the shade. Hostas always make the top ten list for shade plants. They are appealing and practical. Planted in groups, hostas are graceful, lovely. Under trees and bushes they make a floaty fringe. Some arrive early in summer and leave late in fall. Long stems of their tubular flowers add charm to a bouquet. They’re easy to care for returning every year larger and wider with one feeding. They should make the top ten list for almost-perfect plants! Many of my hostas are inside a wood privacy fence. Protected from deer and too much wind, they grow larger and showier every year. Leaves are smooth or have a ribby texture. Some hosta leaves are just one or two shades of green. My favorites are variegated leaves. Their edges are white, cream, yellow or gold. The rest of the leaf is green, pale green or blue green. The reverse is true: edges in shades of green with light colored centers. 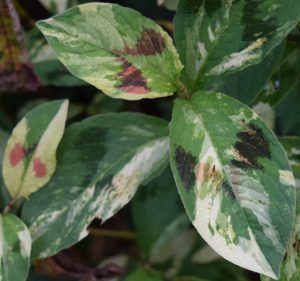 Variegated leaves gleam in a shady area by day. At night they catch and reflect porch light or moonlight. Tubular flowers climb tall stems and are usually white or lavender in color. 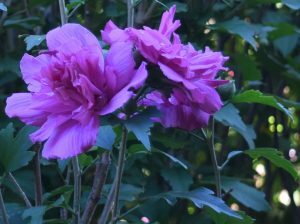 Depending on the variety they can bloom from early summer into fall. Plant tags list bloom times and are a handy guide for planning a succession of blooms. Hostas are more beautiful the larger they grow. Hostas are reliable, durable. They have shallow roots enabling them to grow in many places without disturbing their neighbors’ root systems. They fill in the areas where they’re planted shading out weeds and functioning as ground cover. As perennials, they return every year sending pencil-like shoots out of the ground before unfurling their leaves. Hostas are perennials native to Japan and China. In the U.S. they grow in Zones 3-9. Plant in part shade to shade. Bushes and trees provide a perfect spot beneath their branches for just the right amount of light. New hostas have been developed for sunnier places. Soil should be rich, well drained but hostas can tolerate most soil types. Add compost yearly to provide nutrients and help keep the soil moist. Hostas like it more on the wet side than dry. Because hostas’ roots are shallow, water more often during the growing season. Under a tree they compete with the tree roots for water. Size varies from miniature 8 inches tall to 25 inches tall. Width varies from a few inches to 4 feet or more. It’s important to check the plant tag to find out how big they will eventually grow so you know how much space they’ll need. In a year or two, you can divide them to share with others. Maybe there are more places in your garden for the divided plants. They are great at limiting weeds. Biggest pests in my neighborhood are slugs and deer. That’s right: small mollusks and large animals. Slugs make holes in the leaves which don’t bother me. I used to put gravel or egg shells in a ring around hostas to keep slugs at bay. Slugs don’t like rough textures to crawl over. Not a chore anymore. Instead, birds and toads do a pretty good job of protecting the hostas by eating the slugs. Deer like hostas – not for their beauty but as a food source. So far deer have not been a problem. In our older suburban neighborhood deer sometimes come to visit. Hostas rescued from the super sunny front of the house and planted on the shadier side of the house have not been bothered. I have met a hummingbird every summer sipping from the hostas’ flowers blooming at the side of the house. Despite the fact that the flowers’ color is not the hummer’s preferred red, hummer has figured out that the tubular lavender blooms have desirable nectar. There are some plain green hostas in my enclosed backyard that I dug up from an old store property that was to be demolished. The owner allowed the community to take the plants they wanted. These plain, green reliable hostas are first to come up in spring, stay green all summer. 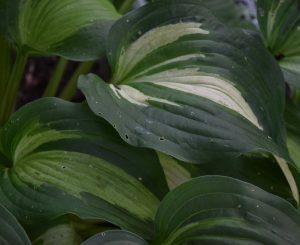 In late August after other hostas’ flowers are long gone, the plain green ones produce lavender flowers that are translucent in the late afternoon light. The flowers also have a little scent. Surprise! They are the last of my hostas to leave the summer party. Purple leaves are what I see when I open the back door. 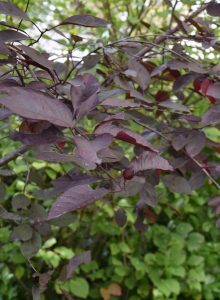 There are two Purple Leaf Sand Cherry bushes across the patio. They screen the neighbor’s wood privacy fence – an extra layer in the spring, summer and fall. They provide a little shade during the day. The sunlight that comes through the leaves change their colors. Some appear purple. Some are red. Others bronze, rust, and green. 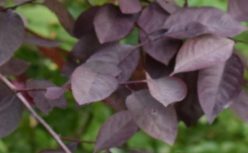 Since the name of the bush begins with purple leaf, I chose that for the name of this site. I could be lofty and say that the leaf color is inspiring; there’s probably a metaphor for life. Maybe there is. But I chose it because I like the colors. Green gardening is what I do. When we first moved here, I was partially going green. I made the change to all green when a next door neighbor came to me with a request. I had applied some weed killer on the lawn that adjoins her property. She asked if I would not do that again. She said she had some serious health problems and using weed killer was harmful to her condition. In fact, she said it was harmful for my family and even our dog. We were breathing it in, it was on our skin and clothes. She was such a great person, caring for others every where she went, including me and my family. How could I turn her down? And that’s how I began green practices. I find it’s not hard to do. No huge change because I was already doing those things in many ways. Forgoing toxins on the lawn was not a big deal. I am still working on reducing the dandelion population in a non-harmful way. Not harvesting leaves for my salad yet. There are cats, raccoons, possums, skunks and the occasional dog off the leash walking through my yard. This does not make dandelions appealing. What I do have are a lot of birds, bees – especially native bees, butterflies and dragonflies. Lots of cool visitors to my yard. And all because of a request by a great neighbor!